Steve and Missy (Fier) Hennen could have used autopilot on their vehicles from Minneota to the Twin Cities. The Hennens just completed their 22nd state tournament trek to cheer on their six children. They have five girls — Samantha, Kelsey, Molly, Morgan and Abby — and one boy, Kyle. Their children have a combined 32 state tournament appearances. Morgan, a junior, and Abby, a sophomore, helped the Vikings to their second Class 1A state championship Saturday with a 40-31 victory over Goodhue. Abby scored 13 points and Morgan five. They were members of the Minneota state championship volleyball squad last fall. Their older siblings have all since graduated — Samantha (2010), Kelsey (2012), Molly (2014) and Kyle (2016). Molly reached the state tournament in basketball and volleyball every year of high school. Kyle was close behind with seven appearances (four in wrestling and three in football). He won the most state championships of the group with three (football in 2014 and 2015, wrestling in 2015). Steve and Missy graduated from Minneota in 1983. Steve played basketball and baseball while Missy, from Taunton, Minn., played volleyball, basketball and softball. “We’re hoping we get at least three more trips,” Steve said. DeLaSalle junior forward Nurjei Weems believed in her team’s talents but put championship dreams on hold until finally getting past Wednesday’s quarterfinals. The Islanders fell in the first round in the past two seasons, setbacks that made Saturday’s Class 3A state championship even sweeter. “That really brought up our confidence, and we brought that energy to the court for this game,” Weems said. This was new territory for Mia Curtis. 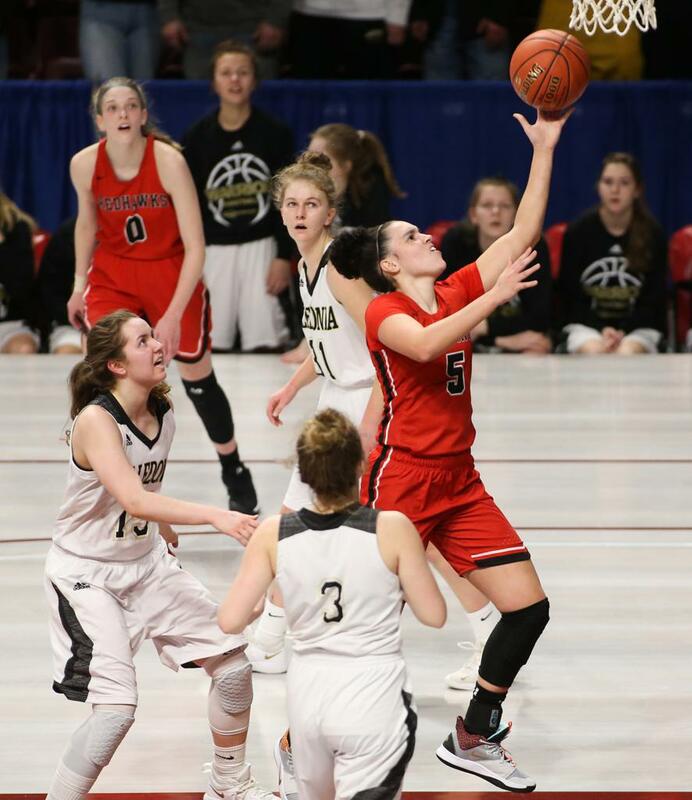 The Minnehaha Academy guard — the team’s leading scorer and highest-profile player — was on the bench with 8:03 left in the Class 2A championship game, having fouled out with 18 points. All she could do was watch, hope and cheer. Roseau guard Kacie Borowicz closed out her high school career by scoring 37 points in the Rams’ 81-43 victory over Albany in the Class 2A third-place game. According to Minnesota high school basketball historian Matthew Pederson, Borowicz finished third in state history for career points in the girls’ state tournament. Borowicz’s total of 319 points in 15 state tournament games has only been topped by Carlie Wagner of New Richland-Hartland-Ellendale-Geneva, who scored 371 points, and Janet Karvonen of New York Mills with 329. With 98 points in three games this year, Borowicz passed her sister Kiley (268 points) and Braham’s Rebekah Dahlman (276) on the career state tournament scoring list. Katie Borowicz, a sophomore, set a single-game state tournament record with 20 assists on Saturday. That broke the mark of 17 set by Albany’s Kelly Skalicky in 1979. The Borowicz sisters are the highest-scoring set of sisters in state history with over 8,300 combined points.